I first met Sister Wendy Beckett 35 years ago when I visited the Carmelite Monastery at Quidenham, Norfolk, to find out whether or not I had a Carmelite vocation. It was thought that only she would have the clout to knock some sense into me and talk me out of making a very foolish decision which could well have wrecked my life. 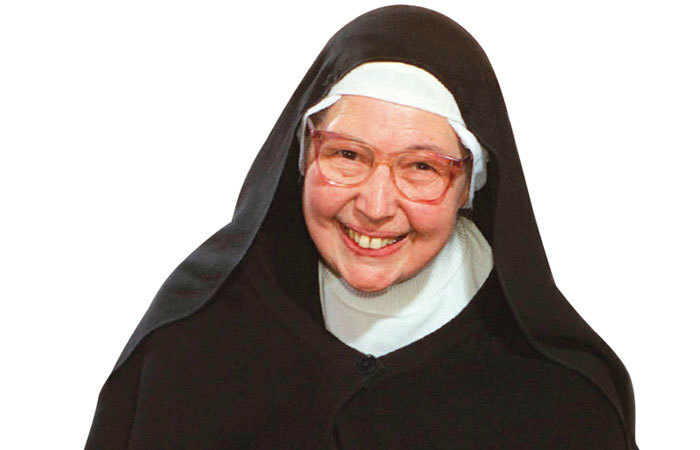 Sister Wendy, who died on Boxing Day aged 88, later became a celebrated art historian and TV presenter. But then she was living in a caravan in the monastery grounds, in the long tradition of hermits going back to Julian of Norwich and beyond. She lived as a totally anonymous hermit who saw no one other than the sister who took care of her physical needs – in effect she had a (silent) maid. Once a month, she spoke for half an hour to the prioress who became her closest friend. I was firmly told that being allowed to talk to her was a rarity and a great concession. Our time together was to be 30 minutes, but such was the economy, directness and bluntness of what she said that 20 minutes turned out to be ample. She was already using pictures to emphasise her messages. When I left, she gave me a cigarette card, with a picture of a rowing boat crewed by large men in fetching stripy jerseys, and a terse note saying I’d never get anywhere unless I was prepared to launch out into the deep. Just after this, I became a Carmelite novice. Roughly once a year, Sister Wendy would hold a much-looked-forward-to conference with the novices, invariably with the help of a picture –without the convenience of a slide on a screen; just shown from an open book. She would speak brilliantly, without a single hesitation or the help of notes, for 40 minutes on an eclectic variety of subjects: Rembrandt’s Danaë and the Shower of Gold (illustrating receptivity), a linocut of a mother and child by Eileen Cooper (tenderness) and Maurice Sendak’s illustrated children’s story Hector Protector (obedience). At that stage in my vocation, the bliss or otherwise of my religious superior was very far from my painfully muddled thinking and I forgot these words of wisdom for 20 years – but suddenly there they were when I became prioress. Sister Wendy was a strange mixture of frugality and irresistible generosity. Left to herself, she liked abundance. In her room, no wall space was visible. Books, postcards, icons, plastic prisms, Dresden porcelain figurines and cheap bling jewellery (not to be worn but to be admired for its sparkle) competed for the tiny space in which she lived and in which it was impossible to move without knocking something over. When she became too weak to continue living in her caravan (a damp dwelling in a damp wood ecologically full of insects), she was moved into a little flat attached to the monastery. I cleaned her bathroom every day – by far the most rewarding job I have ever had – and another (American) sister was responsible for the rest of Sister Wendy’s wellbeing. Occasionally I would hear raised voices. A stickler for correct speech, she would object to the American pronunciation of ‘waater’ or the use of ‘toilet’ instead of ‘lavatory’. Rightly, her other carer would protest. Happily, the toilet/lavatory controversy was solved by the 16th-century Carmelite euphemism ‘humble office’ (which made me, its cleaner, the humble officer). Carmelites are trained not to grumble but, one morning, I felt I had a justified grievance and started to moan at Sister Wendy. I did not always agree with Sister Wendy, sometimes finding her art commentary over-interpretative, but this did not prevent me from loving her. The key to her was her love of God. The joy of her was the broadness of her mind and her ability to communicate this love of God to those willing to hear her out.